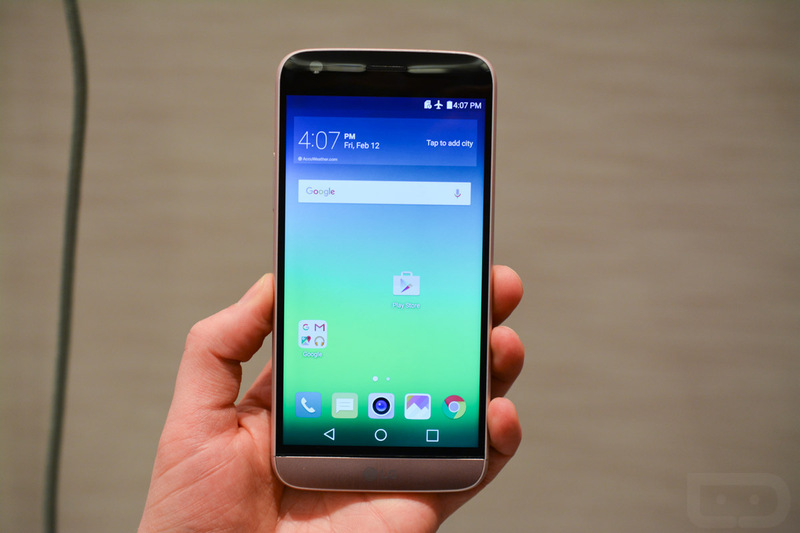 It’s official – the LG G5 is here. 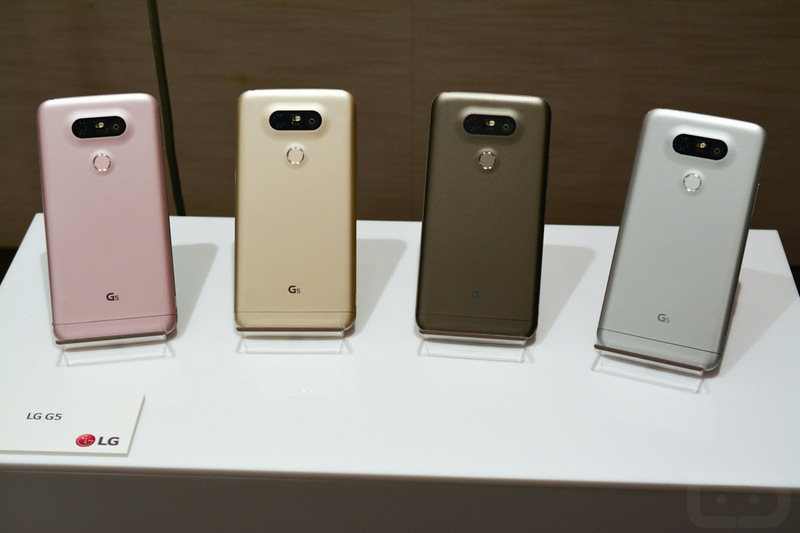 After months of hype, LG took the stage today in Barcelona to unveil its flagship “G” phone for 2016. The phone, because leaks are such a part of this world these days, is in many ways what you expected. I think it’s safe to say that LG also has some tricks up their sleeves with this device as well, though, which has us pretty excited for the year to come. With the LG G5, you are getting a metal uni-body design with slideout battery drawer that makes this one of the first modular phones. We say “modular” because that battery drawer will allow LG to add-on accessories or expand the capabilities of the phone. As of today, they plan to do that with a camera module and Hi-Fi audio DAC. More on that here. The display, as was previously announced, is indeed always-on. Since this is an LCD, you are probably wondering how LG accomplished this? LG says that they “redesigned the display driver IC memory and power management function so that the display’s backlight only illuminates one small part of the overall display.” By doing so, the always-on display only uses 0.8% of the battery per hour while remaining on. The always-on display shows time, date, and battery status and sits in the upper-middle portion of the screen. With this phone, LG seems to have really listened to customer feedback. 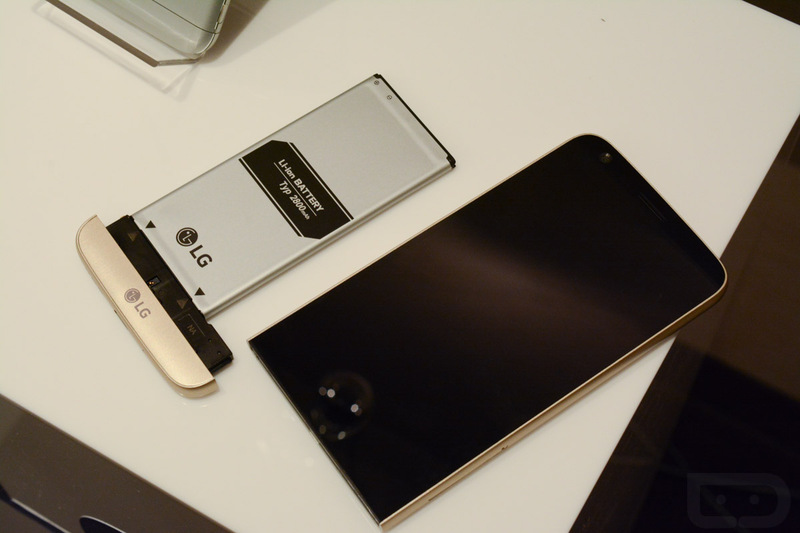 For the first time from LG, we got an all-metal body, but the removable battery remains, along with expandable storage. They also shrunk the display slightly, to make for a better in-hand experience, because customers told them that 5.5-inches might have been ever so slightly too big. LG hasn’t given us a launch date, only that they hope to launch simultaneously across the globe. You’ll want to watch our hands-on video to be able to fully take in the LG G5 experience. The massive press release announcing all of LG’s latest and greatest can be found below. Furthermore, the insulative antenna is invisibly integrated into the body without disrupting the seamless look of the metal uni-body. LG designers took the metal body concept one step further by adding a Shiny Cut edge for added contrast and better “hand-feel”. The LG Hi-Fi Plus with B&O PLAY is an innovative portable Hi-Fi DAC audio player developed in collaboration with B&O PLAY to meet the needs of those who seek to enjoy top-notch sounds that have traditionally only been available through high-end audio devices. LG Hi-Fi Plus with B&O PLAY stands out for its simple yet elegant Scandinavian design as well as premium sound technology. In addition to the 32-bit Hi- Fi DAC upsampling technology first introduced on the LG V10, LG Hi-Fi Plus with B&O PLAY also supports 32-bit 384KHz high-definition audio playback. LG Hi-Fi Plus with B&O PLAY can be used either as a module with the LG G5 or as a separate Hi-Fi DAC by connecting to any smartphone or PC. 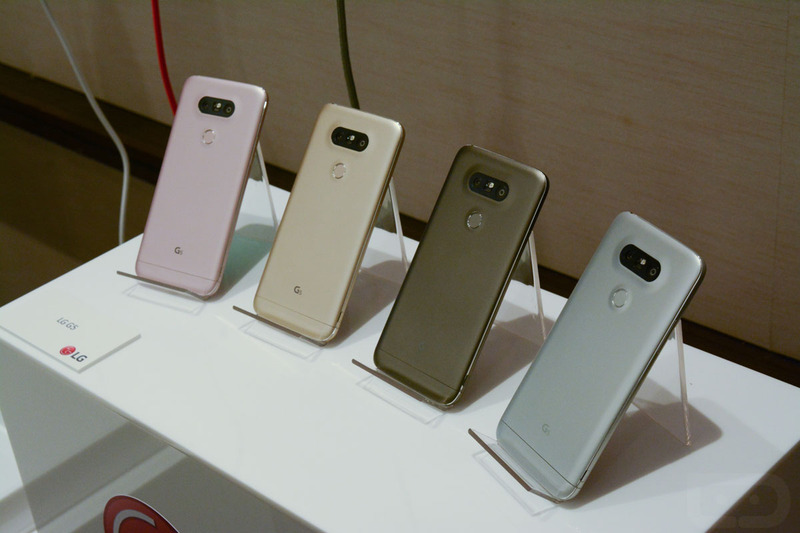 Reflecting LG’s longstanding reputation as a leader in smartphone cameras, the LG G5 has two cameras on the rear: one with a standard 78-degree lens and another with a 135- degree wide angle lens, the widest available in any smartphone. The 135-degree lens on the LG G5 offers a viewing angle that is approximately 1.7 times wider than those of existing smartphone cameras and 15 degrees wider than the human eye’s field of view. The wide angle lens makes it easier for users to capture more landscape, taller buildings or larger groups without having to position oneself further from the subject. 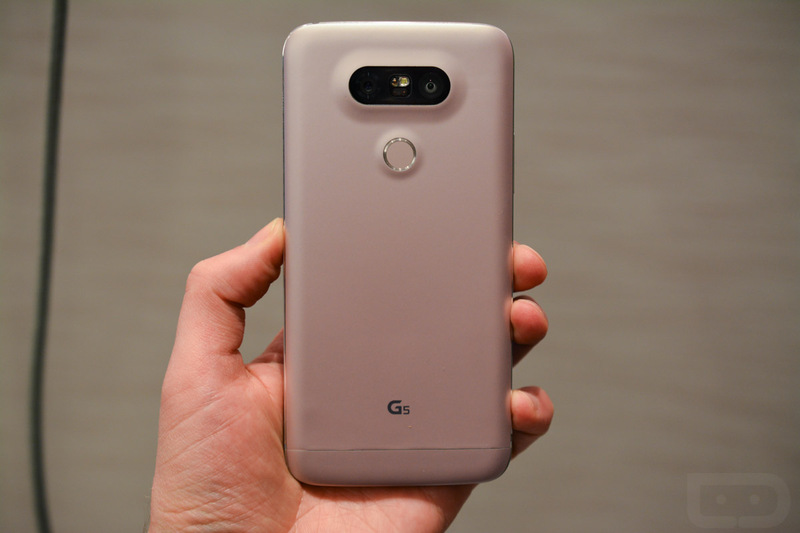 The 5.3-inch Quad HD IPS Quantum display on the LG G5 offers an Always-on feature, the first on a main smartphone display. The concept of the Always-on Display was first introduced in the LG V10 as the Second Screen and now that feature has evolved on to the main display to show the time, date and battery status continuously even when the G5 is in sleep mode. This means that you can always see the time at a glance, even during important meetings or when your hands are full. The LG 360 VR is a VR goggle that can be connected with the G5 via a dedicated cable and works exclusively with the G5 to simulate a 130-inch TV viewed from two meters away. It has a stylish design that is foldable so that users can easily carry and watch VR content anytime, anywhere. Unlike other VR devices that require a smartphones to be inserted in the device, the LG 360 VR weighs only 118g (4.16 ounces) and is just onethird as heavy as competing VR goggles while delivering a resolutaion of 639 ppi. The device is compatible with 360-degree images and videos captured with LG 360 CAM as well as all Google Cardboard content. The LG 360 CAM is a compact 360-degree angle camera equipped with two 13MP 200- degree wide angle cameras, 1,200mAh battery and 4GB internal memory, which can be supplemented by a microSD card. The LG 360 CAM can be easily connected to the LG G5 allowing users to create 360-degree content. The LG 360 CAM provides 2K video and 5.1 surround channel recording on three microphones to help users effortlessly create high-quality 360-degree contents. Thanks to the partnership with Google, images taken with the 360 CAM can be uploaded to Google Street View and YouTube360, adding the fun of sharing creative contents with others. The images will also be available to view on the LG 360 VR or other smartphones or devices that are capable of 360-degree content. The LG TONE Platinum (model HBS-1100), the latest in the LG TONE Series, is a Bluetooth headset that has earned the Harman Kardon® Platinum grade for its superior sound quality. With a Balanced Armature design for minimum distortion, LG Tone PlatinumTM delivers exceptionally sharp and clean sound. What’s more, it is the world’s first Bluetooth headset equipped with aptX™ HDcodec, delivering lossless 24-bit audio for sound that is unrivaled in a wireless device. H3 by B&O PLAY is a set of active noise cancelling high-end earphones that is compatible with the high-quality sound of the LG Hi-Fi Plus with B&O PLAY. Designed for audiophiles as well as anyone who considers audio performance a top-priority in a smartphone, H3 by B&O PLAY works with all Android smartphones. 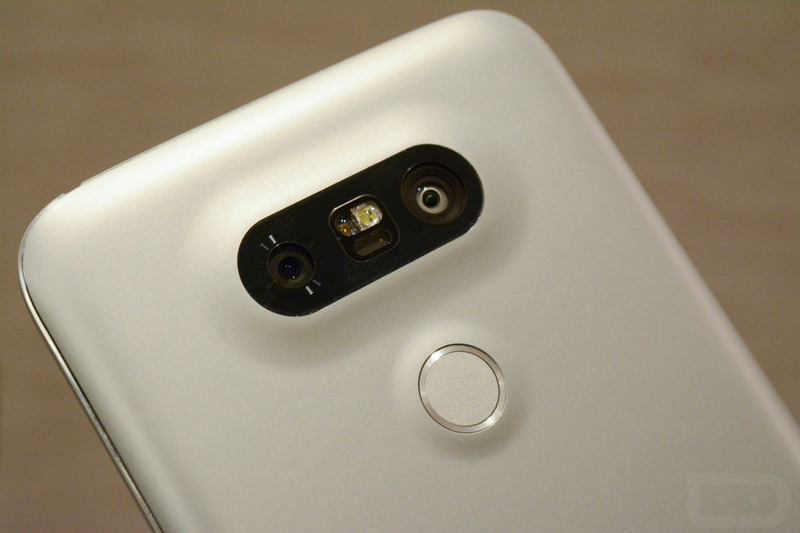 The LG G5 is equipped with the powerful yet energy-efficient Qualcomm Snapdragon 820 processor that offers advanced features such as 64-bit performance, Adreno 530 graphics and lower-power Hexagon DSP as well as Qualcomm Spectra™ 14-bit dual image signal processors (ISPs) designed to deliver high resolution DSLR-quality images and additional power savings. The Snapdragon 820 processor also has an integrated X12 LTE modem that supports Category 12 download speeds of up to 600 Mbps and LTE Category 13 uplink speeds of up to 150 Mbps. Compared to the previous Snapdragon 810, Qualcomm Technologies’ most advanced CPU architecture offers double the speed and power savings. Adreno 530 graphics demonstrate up to 40 percent faster graphics performance and up to 40 percent more power efficiency. Snapdragon 820 supports 4K capture and playback at four times more than the resolution of 1080p, enabling users to watch and capture their daily moments in stunning detail and clarity. The processor is also optimized for VR, generating quality pixels and life-like colors to deliver the ultimate VR experience to G5 users. The LG G5 is equipped with aptX HD, an enhanced codec that supports 24-bit sound over Bluetooth, delivering rich and clear sound over wireless connections without any loss. When paired with the LG TONE Platinum, users can experience superb quality Hi- Fi audio that sounds amazingly close to the original source. The LG G5 offers Qualcomm Quick Charge 3.0 for incredibly fast charging. By employing an intelligent algorithm, Quick Charge 3.0 is 27 percent faster and 45 percent more efficient than the previous generation. The LG G5 has excellent battery life, thanks to the Low Power Location Estimation technology. This solution enhances the battery efficiency by as much as 41.9 percent byimproving the power consumption related to location-based apps.